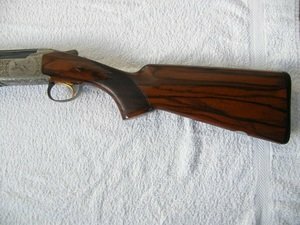 A gun which has had little use but which has a few marks on the stock from being used in the field and from the cabinet. The gun has its case and all its chokes. I have pics and so please send me email details and I will email pics of the gun too you. The stock length is standard - 14 3/4 I think - but different size but pads are available to increase/decrease lop. Nicely game scene engraved and just waiting to be used - I have a number of guns and this has not been used for over a year and so I have decided to let it go.